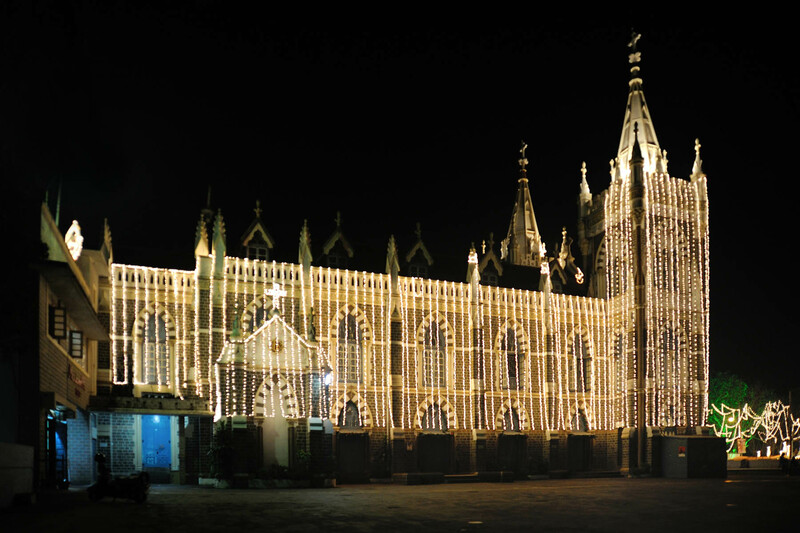 This 'minor basilica' has morphed from a simple shrine into the current beautiful semi - gothic structure that we see and enjoy today. 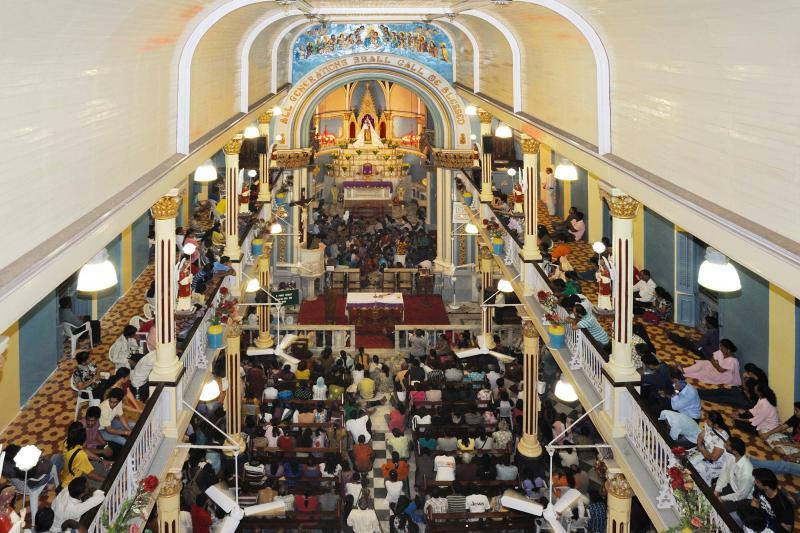 Over the years, devotion and love for Our Lady have helped scores of people contribute towards its development and upkeep. 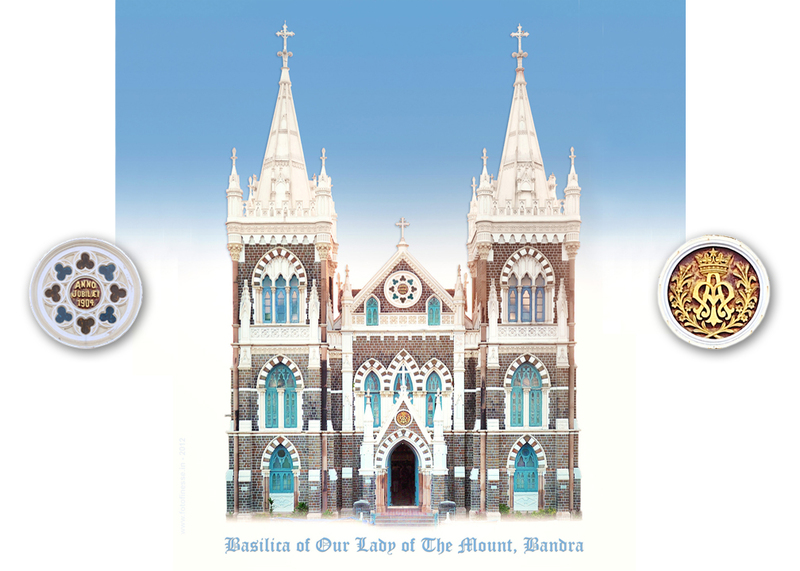 This editorial helps explain the architecture of Mount Mary's . 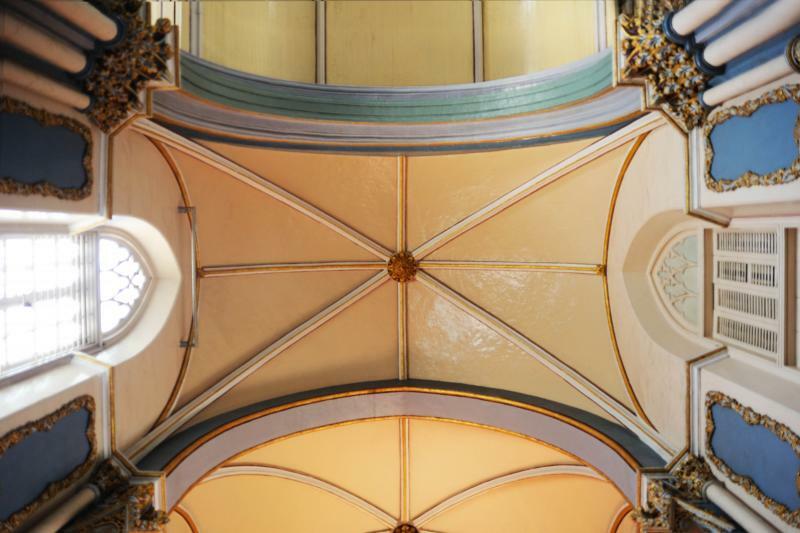 These pictures of the basilica have been carefully shot and chosen, it puts into perspective - dimensions, materials, embellishments that have worked in harmony to create this edifice in stone. 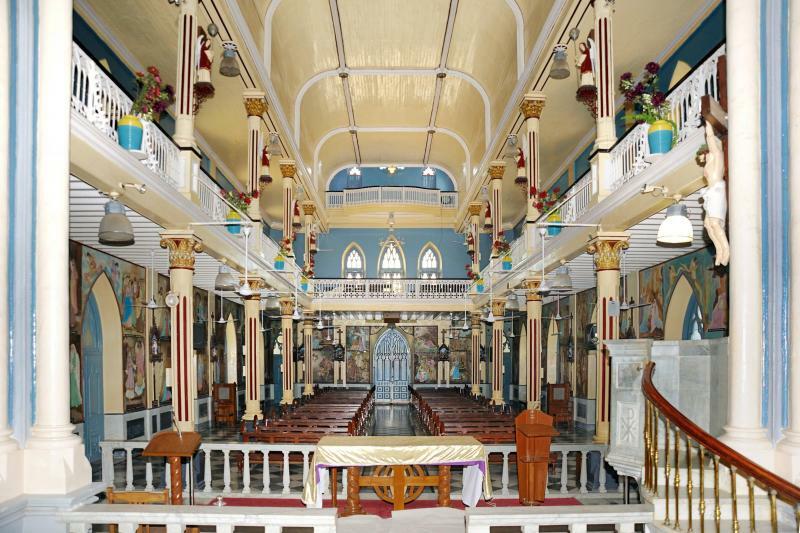 The beautiful and imposing façade of the Basilica is 67 ½ ft broad. Its foundations are rooted in the rock and supported by strong buttresses. 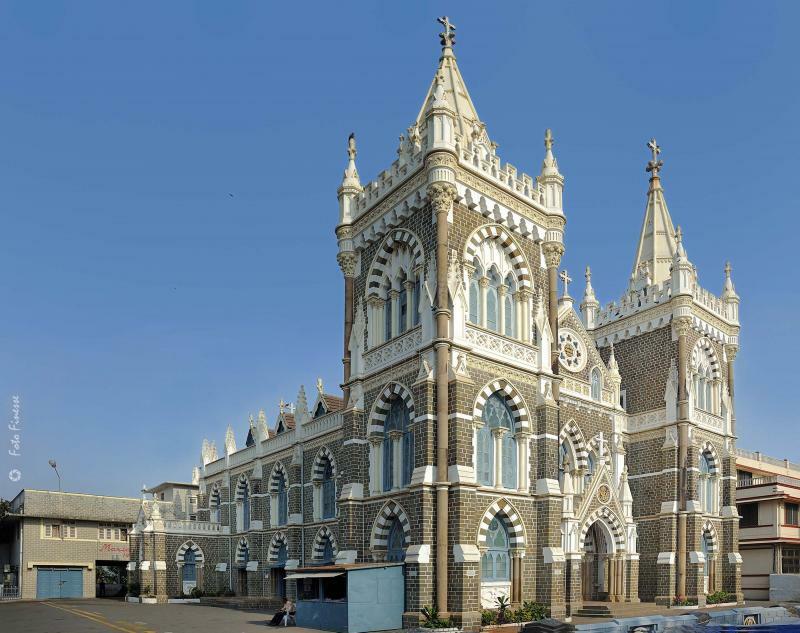 The lowest floor has the main entrance and two side windows; to safeguard the wooden panels of the deep main entrance from the rains, and to enhance the beauty of the entrance, two protective gothic stone arches, supported by elegant round stone columns made of Malad stone, are placed in front of it. The first floor has five windows – two are embodied in the towers and three provide ventilation to the nave. 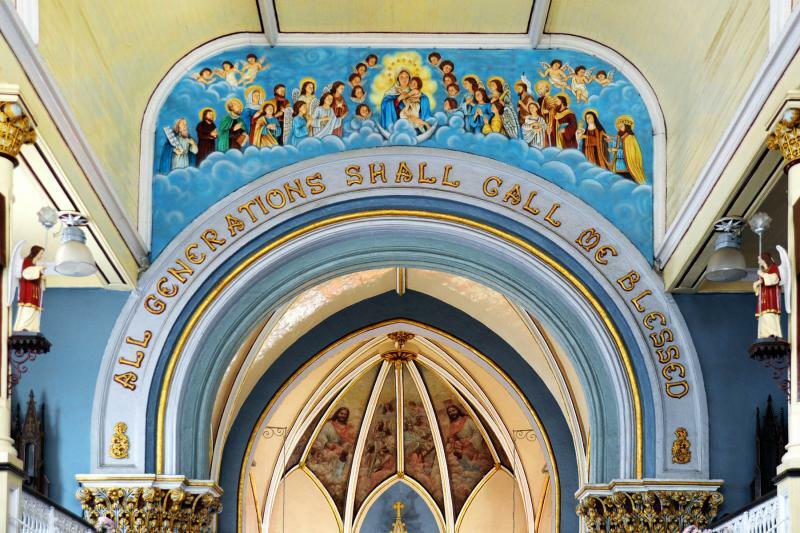 An arch above the main portal has the emblem of the Basilica – AM, initial letters of the famous greeting of Angel Gabriel to Mary at the time of the Annunciation, in Latin: AVE MARIA. These letters are mounted on a crown and enriched by two stems of lilies, symbolizing Mary’s queenship and her virginal purity. The third floor consists of four windows, and a prominent circle with the inscription ANNO JUBILAEI 1904 – the golden jubilee year of the promulgation of the Dogma of the Immaculate Conception, and the year of the inauguration of this new Basilica. The central triangular elevation of this pointed façade is crowned with the cross. The fourth floor consists of the pyramidical spires on either side, also mounted with a Cross jutting high into the sky. - They have foundations 18 ¼ ft in length and breadth, and 98 ft high. 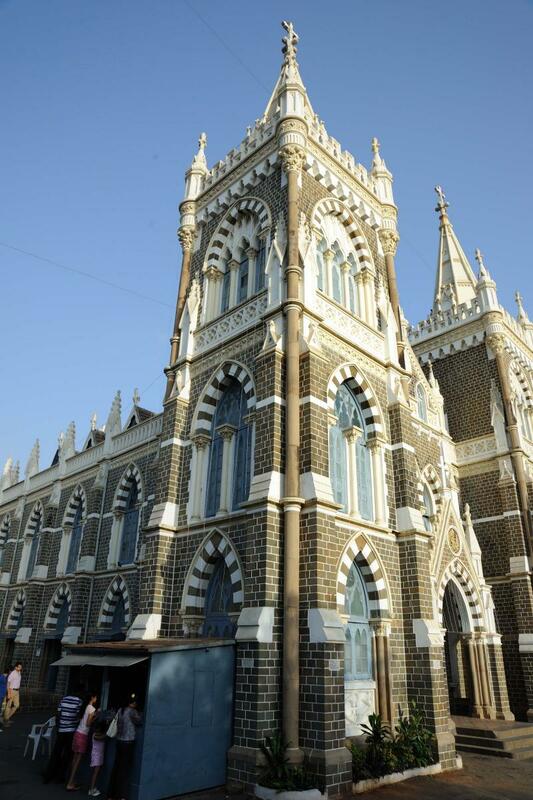 - Each tower has two entrance doors and a staircase leading up to the octagonal steeple. - The steeples and their cornices are raised out of Porbunder slabs and stones respectively, and crowned with a Cross. 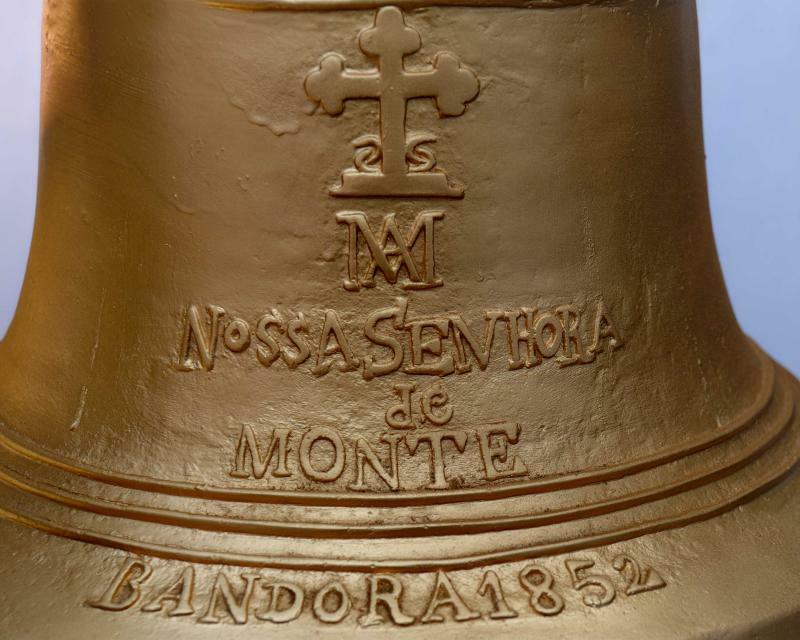 AVE MARIA, NOSSA SENHORA de MONTE, BANDORA 1852. 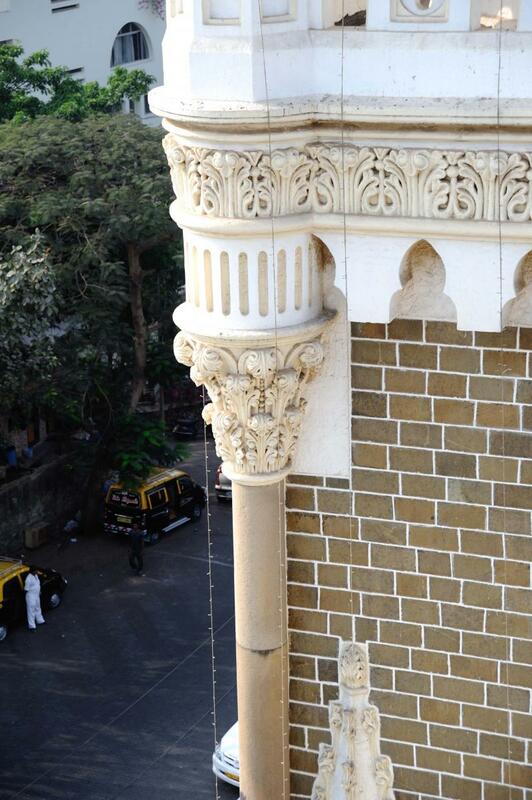 At each corner of each tower a stone pillar with Corinthian capitals is marvelously made to stand erect. All these eight pillars invite visitors to be spiritually strong enough to stand erect and think of things that are high and noble. 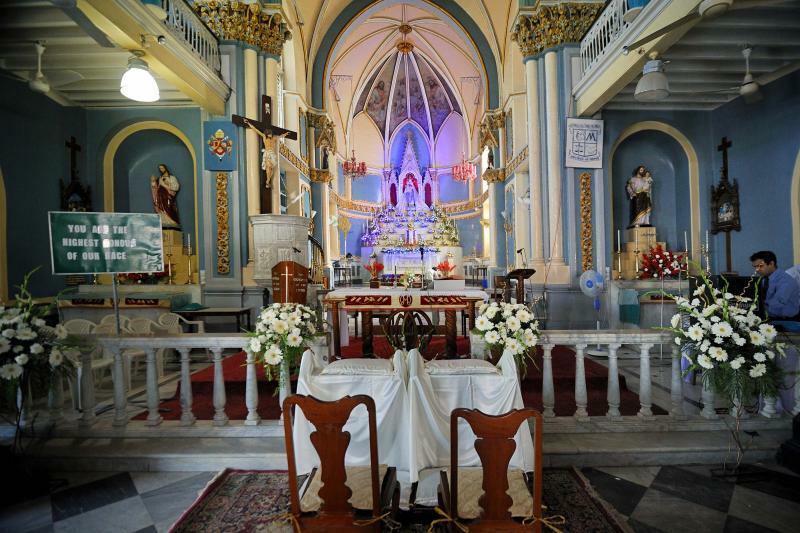 The Nave of Mount Mary Basilica has been erected using both stone as well as wood. The principle shell of the nave is made of stone, and is 66.9’ long and 38’ broad. In addition to the main entrance, there are four side entrances, and above each of these doors there is a large window throwing light into the nave. The inside walls of this stone structure originally bore some beautiful murals, highlighting the events in the life of Mary, painted during the time of the first Rector. Since they had faded with the passage of time, they have been replaced by beautiful fiberglass murals depicting the same story of Mary. 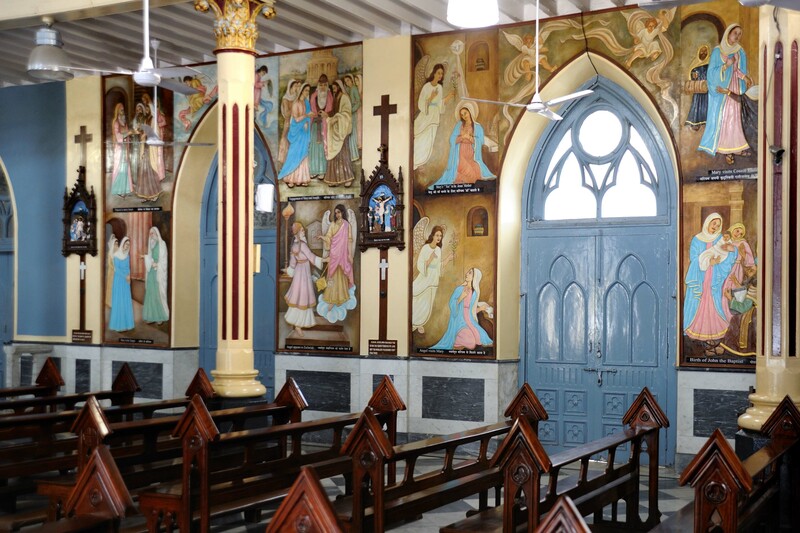 These large panels have been prepared by Sr. Vimala (PDDM) and a group of artists from Goregaon, under the personal supervision of the present Rector, Msgr. Nereus Rodrigues. The ceiling of the nave, 42 feet high, is made of teak wood. It is supported by a three-sided wooden loft on the first floor. The loft rests on either side on four teak wood columns, with fluted shafts and Corinthian capitals. Each column is supported by a strong stone base. The columns hold the weight of the loft as well as the wooden ceiling. On the west side there is even an additional choir loft on the second floor. 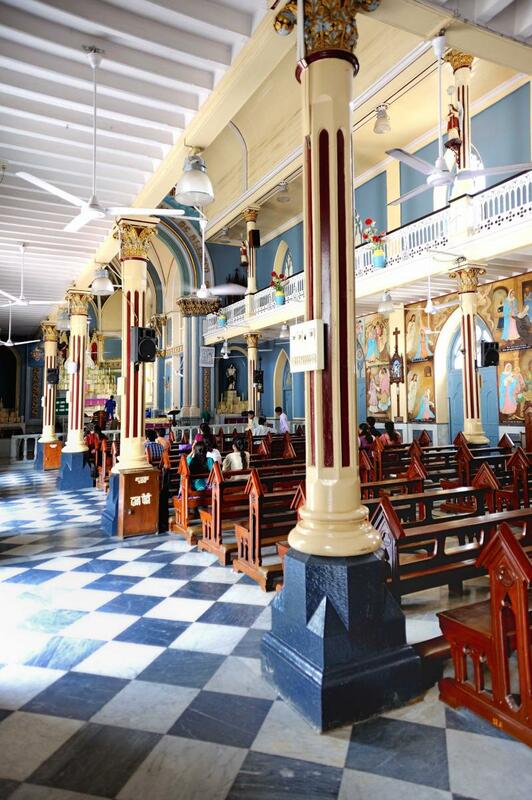 The entire wooden ceiling is protected by a roof covered with Mangalore tiles. The Sanctuary of the Basilica is separated from the Nave by two stone arches, as well as two consecutive elevations of the floor, with steps. The outer arch rests on three round stone columns, whereas the inner one is supported by just two. Two side altars are located outside the first arch. 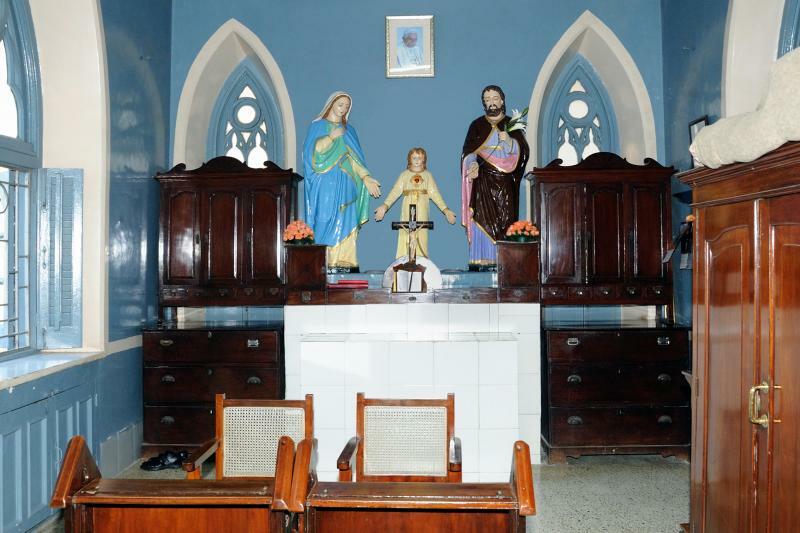 The altar to the South is dedicated to St Joseph. The one to the North, dedicated to the Sacred Heart of Jesus, was consecrated by the late Cardinal Valerian Gracias on the occasion of the Consecration of the Shrine, 8th Nov 1954. Adjacent to the area of the side altars one finds projections on either side. The southern projection is part of the sacristy. The projection on the northern side, which was earlier a side chapel for private masses, now serves at the Eucharistic chapel. When one observes this projection from outside one cannot but notice the letters IHS, encircled by a crown of thorns, which are mounted on the outer side of the rear wall. They stand for the three letters of the Greek word used to spell the name of Jesus : IHSous. 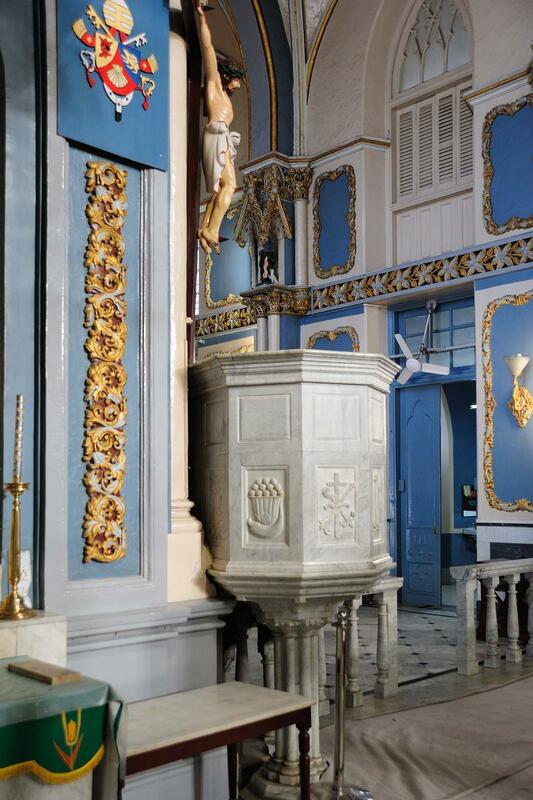 Moving towards the high altar one finds a marble pulpit 4 feet high with 7 steps leading up to it. 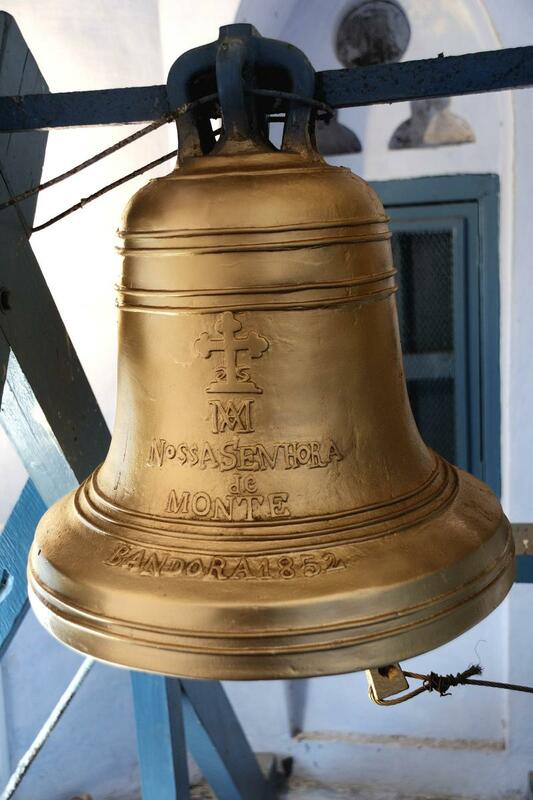 A number of liturgical symbols are engraved on the outer body of the pulpit, like the loaves and fish, the two tablets of the Ten Commandments, symbols of Christ – IHS and PX, etc. 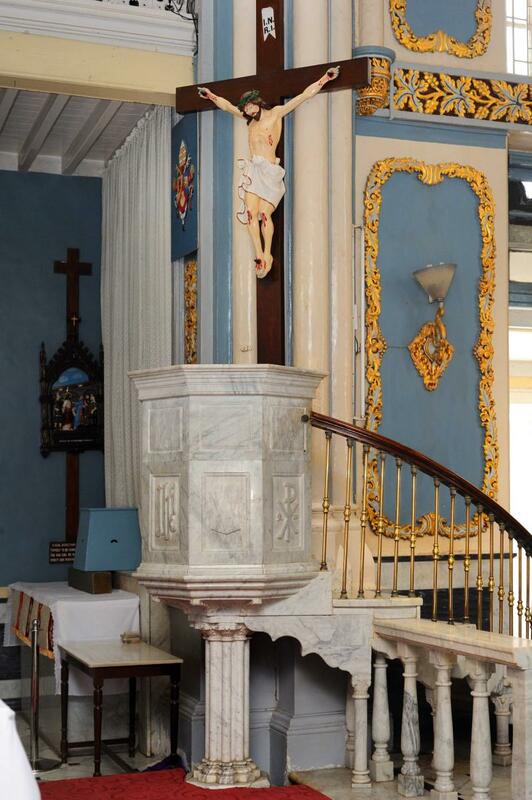 A large Crucifix above the pulpit is reverently approached by most visitors. 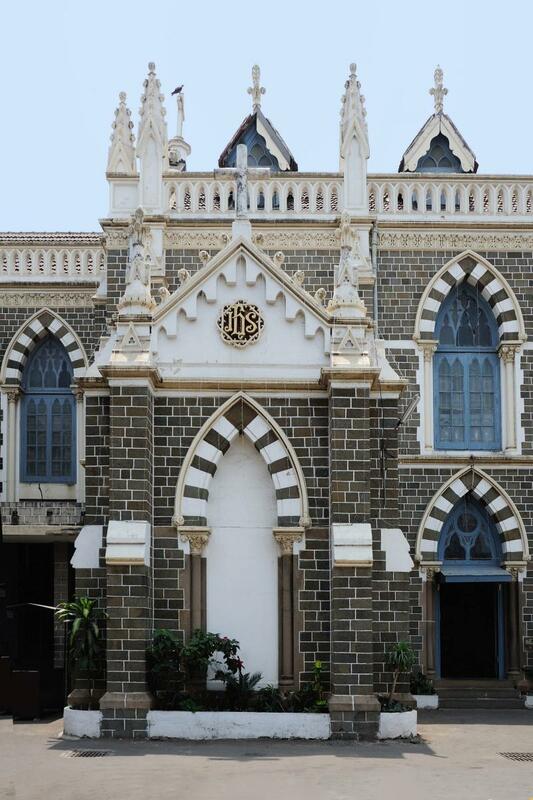 Just below this arch, on either side, one finds the court of arms of the Pope as well as that of the Bishop of Bombay. The Sanctum Sanctorum consists primarily of the seven-step high altar made of white marble. 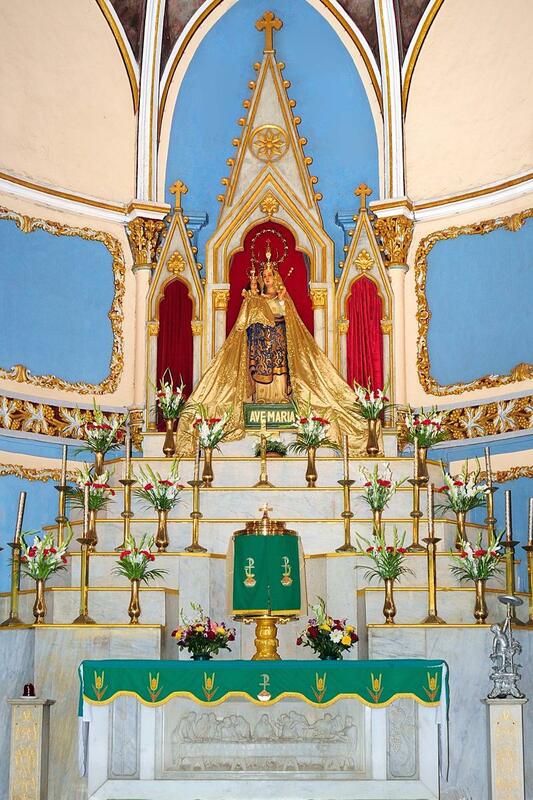 High up on the altar is the venerable statue of Mary with the Christ-child that attracts all visitors. 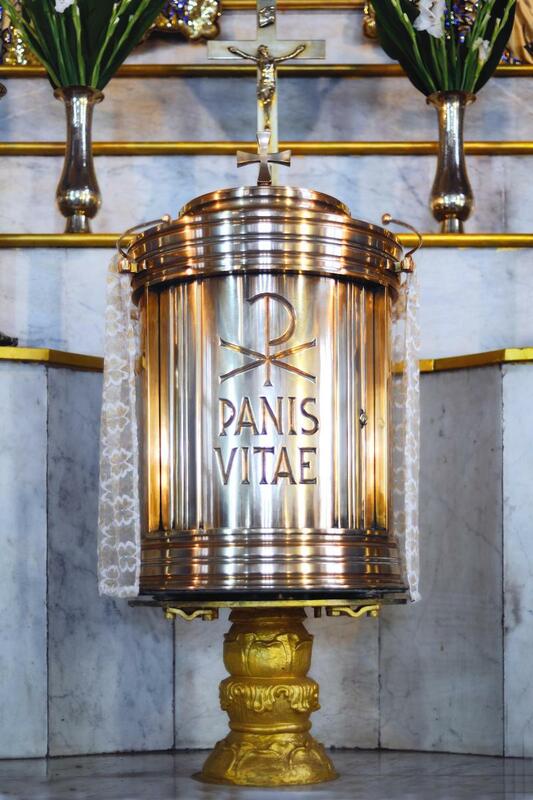 The altar also has a beautiful circular tabernacle to preserve the Blessed Sacrament, with the words PANIS VITAE (Bread of Life – in Latin) engraved over the door. 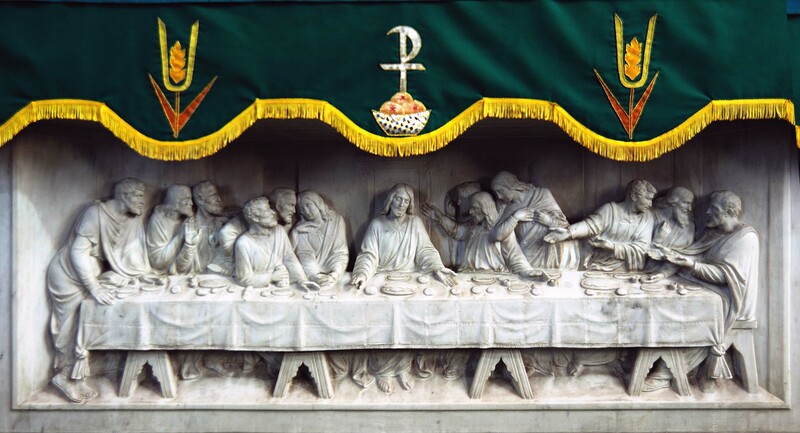 Embedded in the main altar is a marble plaque representing Our Lord’s Supper surrounded by his chosen twelve Apostles. 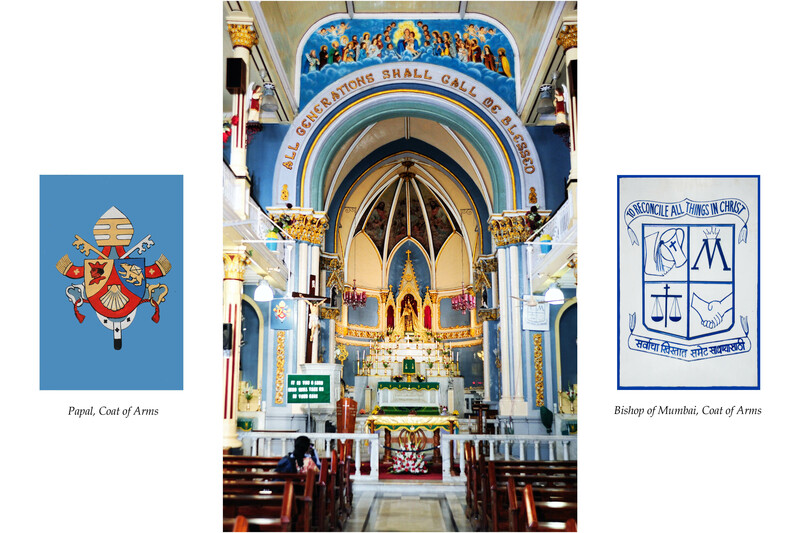 This plaque was inserted later by His Lordship Bishop Longinus Pereira to whom it was presented on the occasion of his visit to the Jesuit Seminary, Vinayalaya, in Andheri. 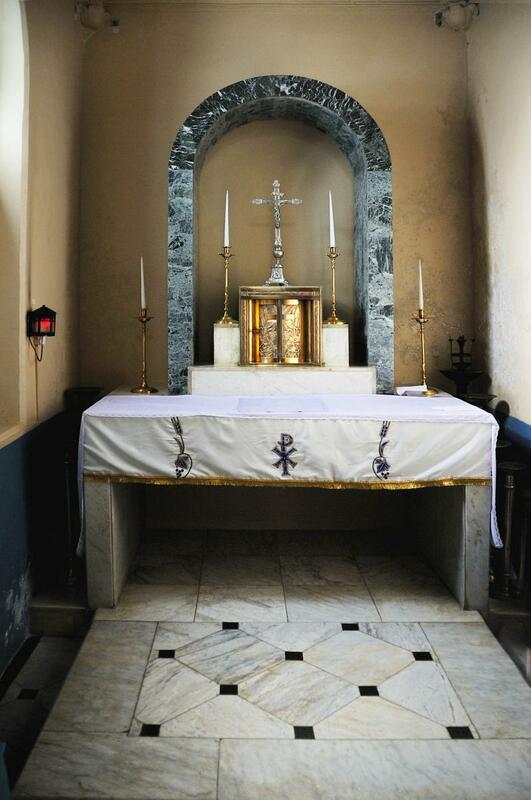 As the new liturgical rites require the priest to face the people, this high altar is no longer used for regular services; these are conducted from a wooden altar in the lower part of the Sanctuary. 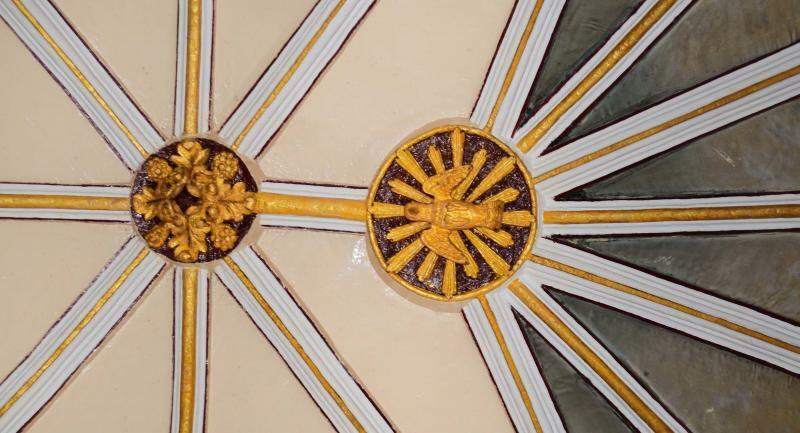 Right in the center of the ceiling of the Sanctum Sanctorum the image of the Holy Spirit in the form of a dove painted in gold and its seven-fold gifts are portrayed in the form of seven gold-plated rays. This ceiling is supported by stone masonry on which are engraved a grapevine with bunches of grapes and leaves.